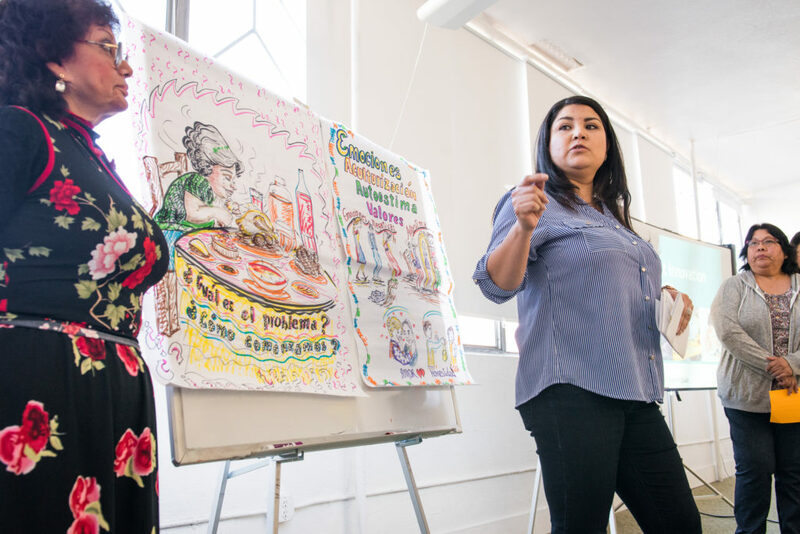 This is the last in a series of articles highlighting the work of the Lab’s Parent Innovation Institute (PII), a yearlong program based in the Fruitvale neighborhood of Oakland, California, that brought together community organizations with the dedicated parents and caregivers they serve. Together, they developed strategies that address parents’ unmet needs and ensure their children are kindergarten-ready. 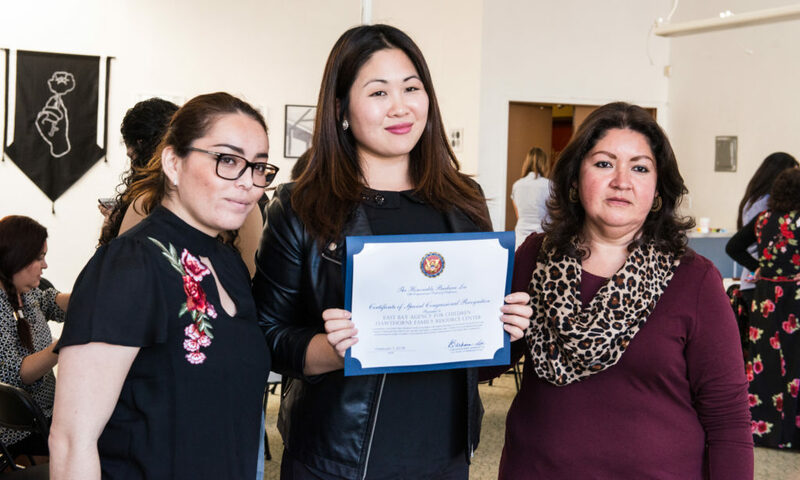 With a palpable sense of accomplishment and pride, and a certificate of completion from the Office of Congresswoman Barbara Lee in hand, the participants of the Parent Innovation Institute have graduated. 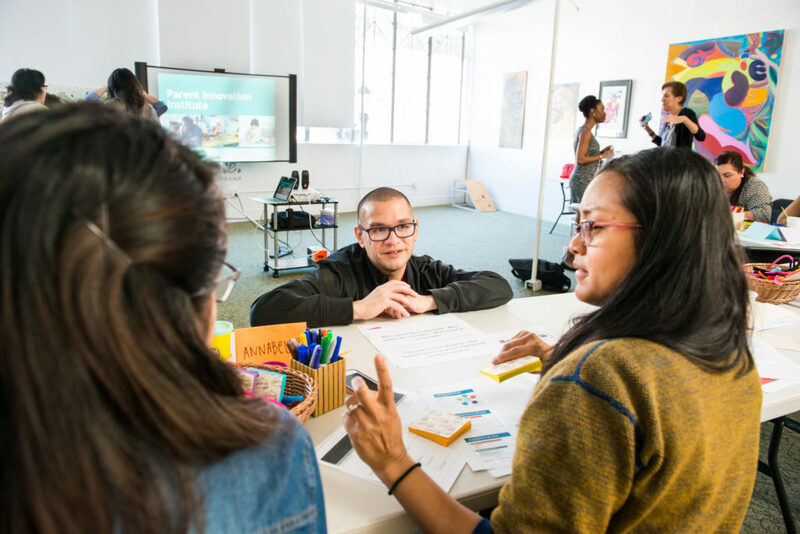 The Parent Innovation Institute has focused on a singular vision — co-creating with parents lasting positive changes to benefit Fruitvale’s children. 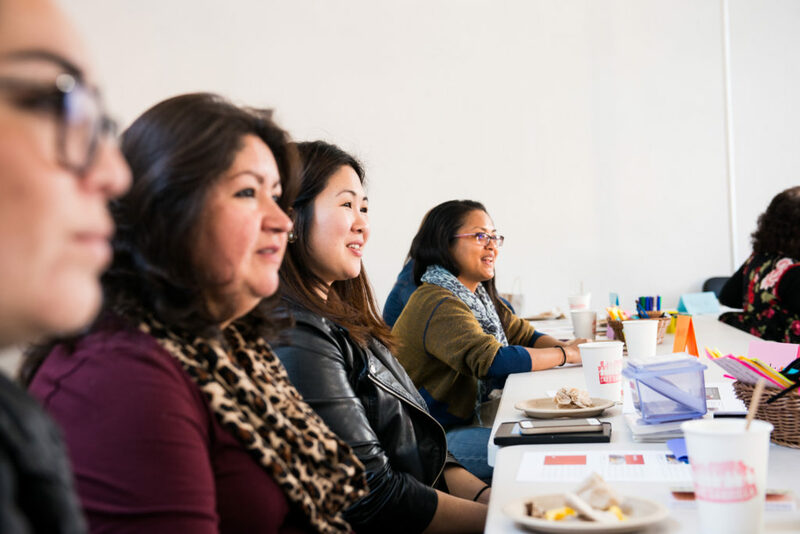 After nine months of committed work, the group of 16 parents, staff, and decision makers from four parent-serving Fruitvale organizations has made impressive strides in meeting this critical goal. 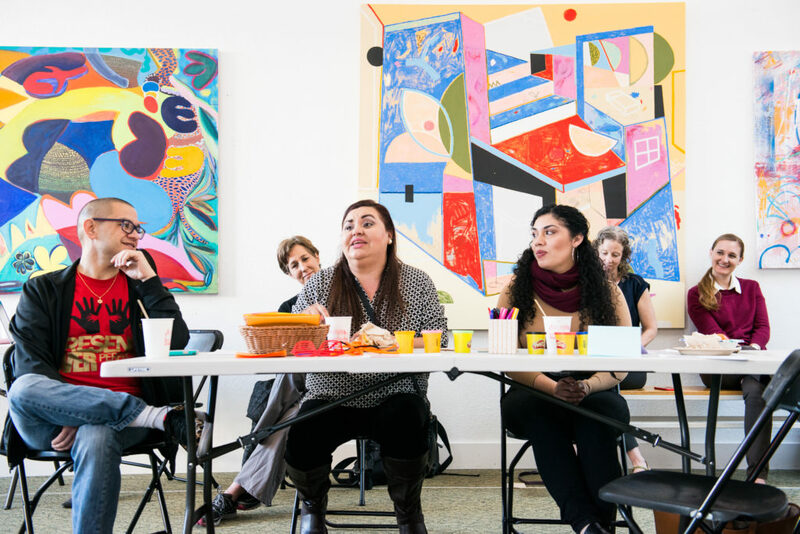 The Institute launched last year, when team members from The East Bay Agency For Children, La Clínica de La Raza, Oakland Public Library, and Unity Council of Alameda County gathered together. Since then, the group has gone through an iterative innovation process, based on improvement science, human-centered design, and social justice frameworks, that encourages creative thinking to solve problems. The nine months included talking to the community, doing research, identifying themes, figuring out which problems to solve, and brainstorming ideas. Over several all-day sessions — plus a lot of hard work in between — all of this culminated with each group launching prototypes in their community. At the capstone workshop, teams showcased the prototypes they developed throughout the institute. The prototypes were the result of many hours of co-creation, and each reflected the unique needs of each organization and the families and children they serve. Throughout the process, the teams learned to tweak their prototypes in real-time, figure out metrics to measure success, and discover what worked and what didn’t. Unity Council designed a prototype to encourage father engagement called Day with Daddy, where dads spend a Saturday doing a hands-on activity with their kids. At the same time, they hosted a group for mothers to get time to practice self-care and build a close community with each other while they wait for their families at Day with Daddy. The team iterated on these prototypes more than six times. They have received a lot of positive feedback and, at its height, the program saw a leap from three dads to 30 dads in attendance. The Library prototyped a six-week preschool prep program to support parents as their child’s first teacher. The program has provided early learning activities to children whose families could not afford private preschool but did not qualify for subsidized preschool. Supplementing the Library’s existing story time, the team added areas for reading, painting, and kinetic activity. The prototype was a success, and the staff found that many families started to rearrange their schedules so they could attend on a Wednesday or a Saturday. La Clínica’s Las Promotoras, a tight knit group of women leaders who are trained to provide health education to their community, developed a curriculum that integrated both mental health and nutrition. Once a week, they held workshops with the idea that Promotoras in attendance would then go out and train others in the community. The prototype garnered the support of additional funders and the curriculum is going to be scaled and introduced to more Promotoras regionally. East Bay Agency for Children prototyped a toy-lending library. The team also found a high need for language resources among parents through the inquiry phase of the innovation process, and subsequently prototyped English as a Second Language (ESL) classes. The lending library was a hit, with young children and their siblings finding new things to explore and learn, and parents reported feeling more confident speaking English after taking an ESL class. The process has also empowered individuals to develop their own leadership style. “For me, leadership is being unafraid of innovation, speaking up about ideas, and also challenging others,” says Unity Council’s Brenda Ortega. Beyond the individual prototypes, the teams learned to think critically about how they designed programs and how to tackle entrenched problems they face everyday. Organizational staff gained strategic skills to ideate and improve programs and services for children. Through the co-creation process, they have strengthened their relationships with parents and they recognize the importance of gathering feedback to better address parents’ needs. Team members share an obvious passion for their work, community, and the next generation. By coming together, the hope is to expand a professional network while also creating close personal connections. “We are building the team to lean into the strengths of others and also keeping others accountable,” says Aida Mariam, director of the Parent Innovation Institute. 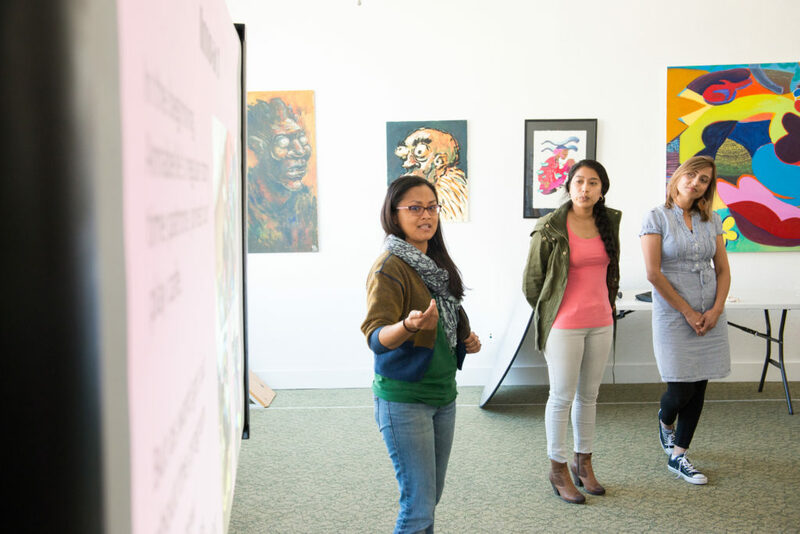 With the organizations serving many of the same Fruitvale communities, the stage is set for collaboration, building even stronger networks, and co-creating new projects. Through their work together, the cohort shared suggestions, supported one another, and pledged to be community partners moving forward. Of course, new ideas are risky. But, if there is no risk, there is no reward. Early on, many in the group expressed concern about putting so much effort into their prototypes without knowing the outcome. They have now embraced the concepts of failing fast and failing forward. “It’s not really failing, it’s just really learning a new way to do things,” says Pacheco. “When you fail, you grow, and each time you fail you get new ideas, and that’s what we really want to do,” says Yolanda Gutierrez from La Clínica. At the end of the Institute’s inaugural year, each group has reported feelings of success after learning the innovation cycle and implementing their ideas in their communities. The Institute hopes to arm each individual with the skills they need to put their leadership into action long into the future. “We hope that the members of the Parent Innovation Institute will take what they’ve learned and use it to address other problems in their communities, feel empowered to create change and harness their collective power,” says Mariam. The Institute has been a learning space for both its participants and us at the Early Learning Lab. In the coming months, we will share a report on the impact and insights from the Parent Innovation Institute.